Honey is a little funny. It’s not sugar……… but it is sugar. It’s “better” than sugar, but it’s still basically sugar. It’s “approved” by healthnuts, but I still manage to abuse it. when I needed an emotional boost. when I felt like my energy was low. when my lunch was less than satisfactory. when my hot tea was “inedible” without it. when my oatmeal, peanut-butter, raisin granola bar in a bowl wasn’t nearly as yummy without it. Cause it is true. He was right. It IS basically just sugar. And although I can see why people say that it is “healthier” for me than sugar, when it boils down to it… I was eating it for wrong reasons. I wanted that sugary, sweet taste… which is not bad in and of itself, but I wanted it all. the. time. So, I had to Just Say No to honey. Haha… that’s kind of funny isn’t it? Had to “just say no” to… HONEY? But I knew that it was creeping in as a stronghold and I thought it best to nip it in the bud. I didn’t do that last year with bread and I allowed bread to become my go-to. my addiction. my comfort. my “need”. But I am learning more and more and then again and again that if something is “tripping me up”… sugar, bread, facebook, meat, working on the sabbath, and now, honey… that it’s gotta go. I don’t want anything holding me back. I’d much rather “sacrifice” some luxuries in my life and life a life of fulfillment than keep those things. Note: I wrote the above part of this post back in late January and, needless to say, aside from never getting around to publishing it, I also never got around to “quitting” honey. I definitely cut down on it, but I was still going to it for a “fix”. Well, a couple of days ago we were out of honey and I wanted to make some granola bars for my son’s lunches, so I picked some up when I went to the store. Good ol gluttonous me grabbed the biggest one. Then I thought, “Well, I don’t want it to get all crystallized and wasted since I don’t eat as much of it anymore.” So, I went to replace the jumbo one and get the medium sized and that’s when I noticed the price! 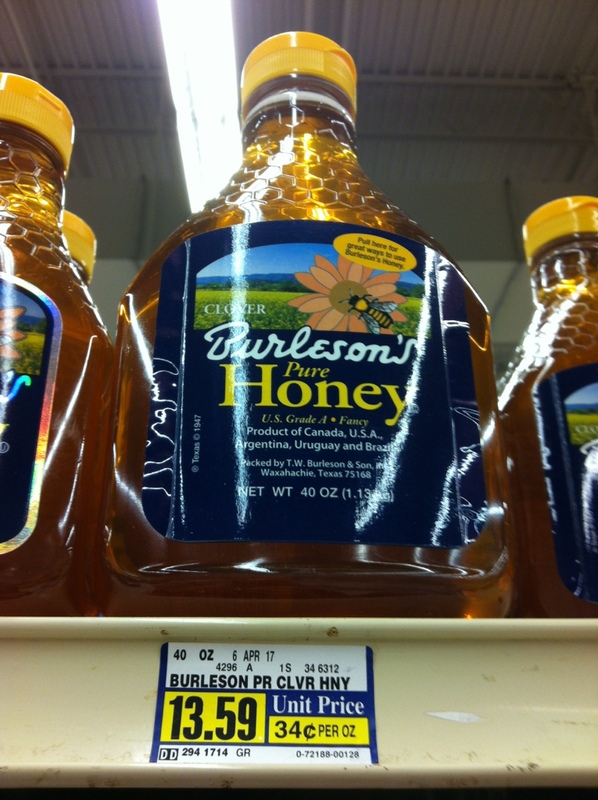 Well, that pretty much solidified the no-honey initiative in my life! It figures out to 34¢ an ounce which doesn’t seem like a lot but I know that we’d blow through those 40 ounces in a month. And I do know that $13.59 is a lot to spend on a luxury once a month. That’s ten shirts from the thrift store for my son who definitely needs a few more. That’s a lot of loaves of bread for lunches. That’s three or four visits to Starbucks (which I’d much rather have than honey)! So, my soul might be on a diet from honey but, now, so is my WALLET! Ha! I like honey. I think it has health benefits when eaten in raw form (albeit, in moderation). I use it for allergies, face wash, and I once cured puppies from parvo using honey, yogurt, and some herbs I had in my kitchen. There are also reported health benefits ranging from decreased cardiovascular disease, mental clarity, and decreased anxiety with daily use of honey. Although by “daily use” I believe they mean a teaspoon at a time, a couple of times per day. I would agree that if you are dumping it on, it’s probably not as good. lol.